Classification is an ancient craft to help humanity understand and navigate the world we inhabit. 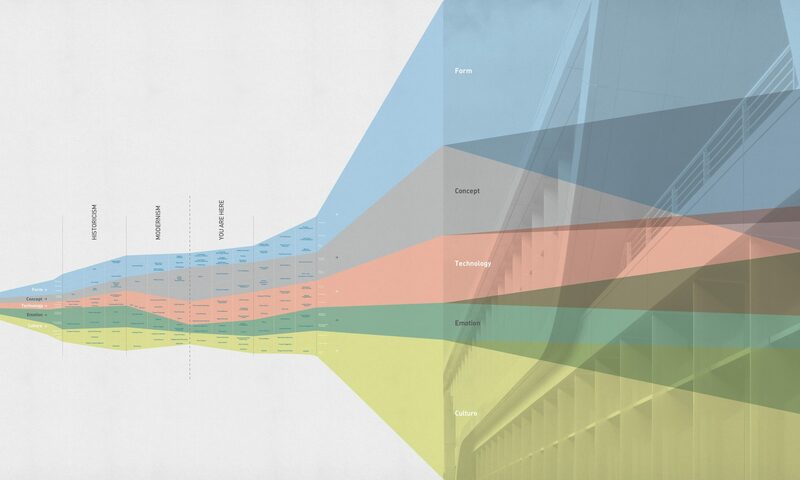 This chart is as ambitious as it is operational in the attempt to comprehend the intersection of the paths between modernity and architecture. Temporal categories are outlined in four columns: Historicism, Modernism, Present Day, and 2nd Century Modernism. These represent time blocks of uneven duration. It is a suggested time sequence based on a personal reading of perceived large-scale facts and their interrelationship to a likely design outcome. These four headings map the chronology of the open-ended list of categories across the century, highlighting how ongoing concerns of architectural culture find renewed forms under changing conditions. The first three columns represent an analysis of from where we have progressed, while the fourth column offers a vision of the future (hence 2nd Century Modernism), a possible configuration of things to come in the realm of architecture. Counterpoint to these vertical historical slices are five horizontal categories that together create a dynamic matrix in motion. In one way or another all designs come to terms with this cluster. Architecture manifests itself in a particular Form, embodying a Concept, engaging a specific Technologies, producing in the user an Emotion largely determined by Cultural circumstances. This is an a-historical condition that can be traced under any circumstances, ages, and latitudes. Over time, these five rows have changed their importance factor in the design community. Concept and Technology loom large today while emotional meaning and culture have gotten much smaller. This in many ways illustrates our current condition of alienation in relationship to the public, and their lack of affection for Modernism. Each row is further broken down with lines depicting changes in value using verbal descriptors. At times these changes swing back and forth in a dialectic fashion as ideas have reached their apex of value and in their inevitable decline have produced counter reactions in the design culture. In the past the lines between these categories has been sharply drawn, however in 2nd Century Modernism, the rows are seen to co-exist in a state of dynamic balance, in fact they are ultimately portrayed as overlaying each other, enriching each other, synergistically enhancing their effectiveness and meaning. In this humanity graph we come with a point of view. We delve into an investigative endeavor to draw imaginary lines between floating dots in the fuzzy vision of where the here and now is, and towards a future …… fundamentally to shed clarity, in one image, of all that makes us what we are. We invite a dialog for others to suggest alternatives to this condition.